30 Rock is NewsRadio 10 years later | Tales From The Ipe! 30 Rock is currently one of my favorite shows. The acting is top-notch, the plots are very quirky, and I find the show extremely entertaining. Much like NBC’s reimagining of the BBC’s The Office. It premiered alongside that other show about a sketch comedy show, Studio 60 on the Sunset Strip, which I did not find enjoyable, and was ultimately canceled. However, 30 Rock continues to struggle in the ratings. I suppose it’s doing decently, but plenty of decently performing shows that are actually good, eventually get canceled all the same. The cast works comedy magic — Tina Fey, Tracy Morgan, Alex Baldwin, Jane Krakowski, and all the supporting cast members in the ensemble. 30 Rock’s predicament reminds me of another quirky comedy on NBC back in the mid-90’s, where the acting was top-notch, and the plots were hilarious: NewsRadio. 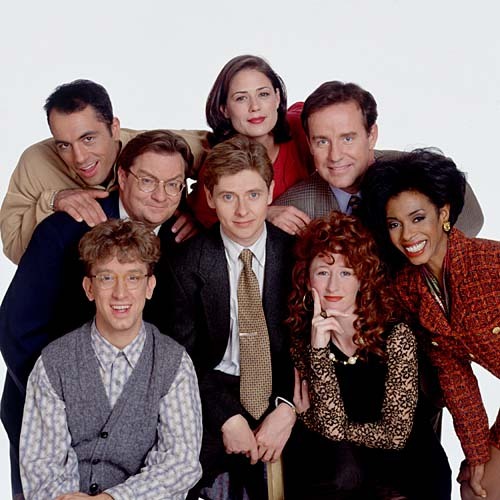 The cast also featured comedy pros — Phil Hartman, Dave Foley, Stephen Root, and other strong ensemble cast members. NewsRadio didn’t make it, as NBC kept shuffling it around the schedule every season. After Phil Hartman’s tragic murder, the heart of the show was gone. The show never recovered, and it was canceled. I hope 30 Rock lasts many seasons. I need the laughs sometimes.